The 2015 Stampin’ Up! Occasions Catalog for Spring is coming to you soon (Jan 6th!) and I am so very excited. I had a chance to preorder stamps and paper from the catalog (you can too- learn how). 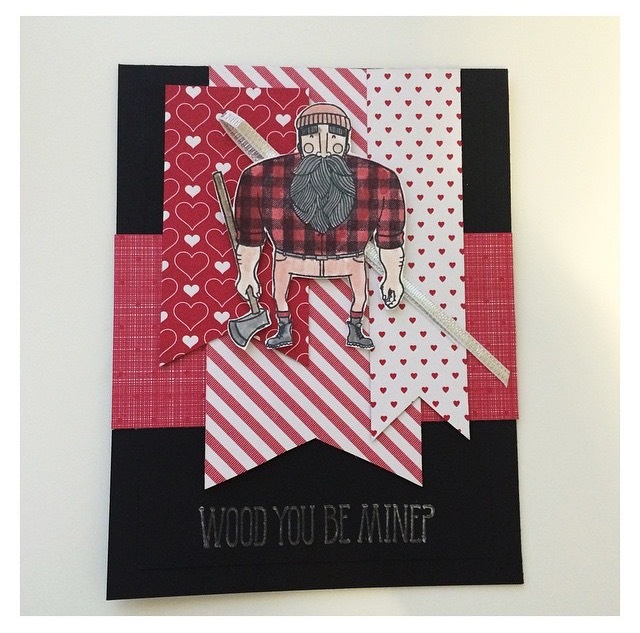 One of the items I chose, is the Wood You Be Mine stamp set because it has a LUMBERJACK, and my Husband’s nickname is Timbers, and his family is full of loggers by trade. Perfect set for our family, right?!? I cannot wait until I have more time to play around with this stamp set, but when I opened the Stampin’ Up! box, I tore into this right away. Since my husband is Timbers, and the stamp set is Love themed, I needed a Valentine’s Day card. This would be the perfect Vday set for him. So I grabbed my favorite Stacked with Love DSP and Wood You Be Mine and started crafting. Here’s what I came up with. Do you LOVE it as much as I do? I love the patterns of the Stacked with Love DSP stack- they have so much texture to them. And of course, the lumberjack had to be cut out and popped up with dimensionals. I’ll leave you with a supply list below. Cheers!